The Moffatt House Abroad - ZineWiki - the history and culture of zines, independent media and the small press. The Moffatt House Abroad is a science fiction fanzine by Len Moffatt and June Moffatt. In 1973, Len and June Moffatt won the Trans-Atlantic Fan Fund for a trip from the U.S.A. to Europe and The Moffatt House Abroad is an account of their trip. It was published in 1974. The Moffatts write about attending the 1973 Eastercon in Bristol, England. Their writing is illustrated with photographs and cartoons. 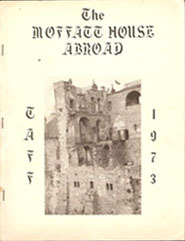 For thirty years, from 1974 till 2004, The Moffatt House Abroad enjoyed the distinction of being the only full-length North American TAFF report completed and published, until Steve Stiles published in account of his 1968 TAFF trip, Harrison Country. Len Moffatt had been one of the editors of Shangri L'Affaires, and one of the editors of The Outlander. Len and June Moffatt published Moonshine for FAPA and, later, The JDM Bibliophile. This page was last modified on 27 March 2013, at 20:52.